From the September 2015 Desktop News | Robert Abernathy, chairman of the board and chief executive officer of Halyard Health Inc., will present “Transforming a Company” for the Helen Crow Mills and John Carroll Mills Lecture at 4 p.m. Thursday, Sept. 24, in the Mortar Board Room, Room 300 of the Ferguson Student Center on The University of Alabama campus. The lecture, which originally was scheduled for March 5, is free and open to the public. Abernathy, a UA alumnus who majored in chemistry, will discuss the recent transformation of Kimberly-Clark Health Care to Halyard Health. The 18-month process transformed a division of a large consumer products company to a stand-alone, publicly traded company with a market capitalization of $2.2 billion. Halyard Health sells medical technology and supplies for infection prevention, surgery, respiratory health, pain management and intravenous therapy. The company had $1.7 billion in sales in 2013 in 100 countries. It operates 12 global manufacturing facilities with 16,000 employees worldwide. Abernathy will discuss the process of forming the company, reshaping its strategy and changing the culture. 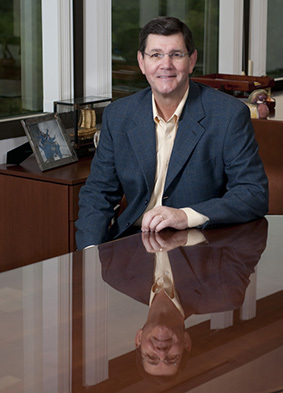 Before being named chairman of the board and CEO, Abernathy held positions as group president of Kimberly-Clark businesses including North Atlantic Consumer Products and Developing and Emerging Markets. Abernathy joined Kimberly-Clark in 1982 as a research scientist and later held positions in plant management before becoming vice president of diaper operations in 1992. He serves on the Radio Shack Corp. Board and the board of directors for the Advanced Medical Technology Association, or AdvaMed. He is also a member of The University of Alabama College of Arts and Sciences Leadership Board, Fox Cities Performing Arts Center Board and the World Vision National Leadership Council. He earned a bachelor’s degree from UA and received a master’s degree from the Institute of Paper Chemistry at Lawrence University. The Mills lectureship was established and endowed in UA’s College of Arts and Sciences by Helen Mills Pittman and her late husband, Dr. John Mills, of Birmingham, to bring successful and distinguished alumni and citizens to campus to speak as a way to motivate and inspire students. Helen Pittman received a bachelor’s degree from The College of Human and Environmental Sciences at UA in 1959. She is president of Crow Real Estate and Insurance Co. in Birmingham and is a longtime member of the Leadership Board of UA’s College of Arts and Sciences. The late John Mills received his bachelor’s degree in pre-dental studies from The College of Arts and Sciences in 1955 and a dentistry degree from UA’s School of Dentistry in Birmingham in 1958. He practiced endodontics for 29 years and was a diplomat of the American Board of Endodontics. Mills was a pioneer in endodontics in Alabama and the only board-certified endodontist in private practice in Alabama for many years. After leaving private practice, Mills became director of the endodontic program at UA’s School of Dentistry in Birmingham.